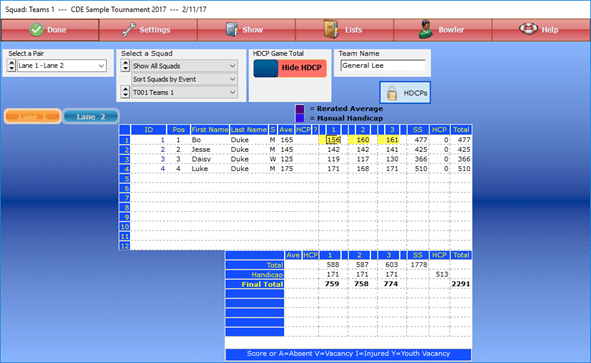 The best advanced bowling tournament management software for automatic scoring back offices at the bowling center, supporting both scores and financials, with integration of Brackets. BTM-2017 Standard promotes the best advanced tournament management software for Windows integrated with automatic scoring system back offices at the bowling center. 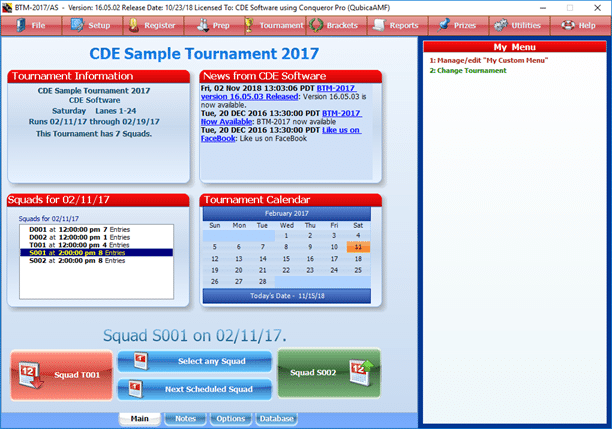 CDE Software uses its over 40 year experience with bowling software to provide the most comprehensive and best tournament software in the industry that is powerful, yet easy to use. This edition expands on our BTM-2017 Professional edition features and integrates with popular electronic scoring systems in our Automatic Scoring Partner List. This edition is not for home use. Easy navigation to get at functions, organized in a manner that follows the tournament process. Run as many scratch or handicap tournaments on your computer as you wish. Tournaments can be men, women, boys, girls, adults only, youth only or adult and youth. Bowl up to 6 different events, made up of singles, doubles, trios and/or teams. Each event can have up to 6 games. Four All-Event categories are available that will combine scores from bowled events. Built-in financial module to manage finances for the tournament. Supports and is recommended by the United States Bowling Congress, Canadian Tenpin Federation and The National Bowling Association for the 2016/17 bowling season. Flexible reports and tournament results. Embellish reports with logos, different fonts and other ways to distinguish your tournament from others. Add some interest during tournament play by offering bracket sidepots with the integrated bracket module. Random shuffle bowlers and display payouts and alive lists. Rapidly enter scores using the keyboard. Bowlers can be moved using mouse or keyboard shortcuts. Easy handling of absentee, vacancy and injured scores. While tournaments are simpler than leagues, there are variations in tournaments, such as handicap calculations and divisions layout. 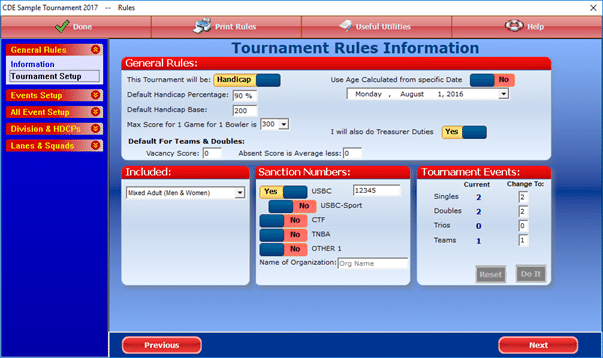 BTM-2017 offers a logically organized configuration screen to configure the tournament rules. Download the program installer and install the software. 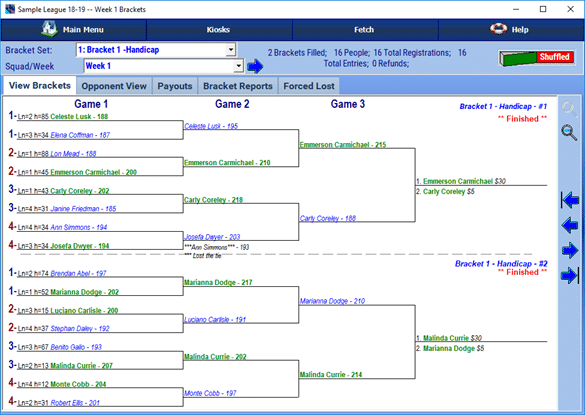 The software will run in Demo Mode allowing you to check out the sample tournament and check out most program features. Purchase from our online store when ready or call our sales department to place the order by phone. This is the primary installer for the BTM-2017 Standard, Pro and A/S bowling tournament manager software. If you purchased BTM-2017, use this installer for Standard, Pro and A/S editions. This installer also updates existing installations of BTM-2017 to the current release of BTM-2017. If you purchased BTM-2017 or wish to try a demo of BTM-2017, use this installer. This installer also updates existing installations of BTM-2017 to the current release of BTM-2017. Operating Systems Supported: Windows 10, Windows 8.1, Windows 7, Windows Vista, Windows 2016 Server, Windows 2012 Server and Windows 2008 Server w/ Service Pack 2 Update. Supports 32 bit and 64 bit versions of these operating systems. BTM-2017 AutoScoring is our popular edition for management of bowling tournaments at bowling centers with compatible electronic scoring editions. This edition is part of our industrial products, which are editions used only at the bowling center and integrate with a specific scoring system. Tournament managers at home needing the consumer edition that can be used at home will need the BTM-2017 Professional Edition product. 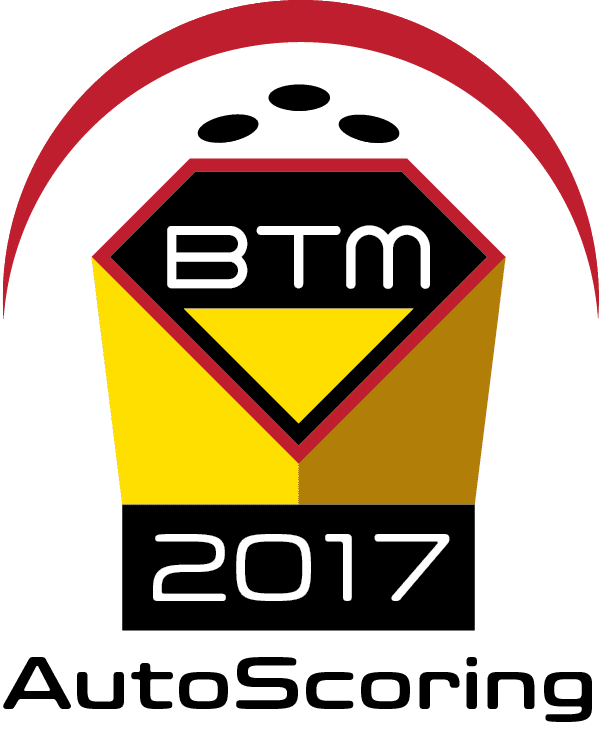 BTM-2017 AutoScoring is designed to make your work easier and enjoyable to where you will always want to be the tournament manager. The United States Bowling Congress (USBC) is supported along with the Canadian Tenpin Federation (CTF) and The National Bowling Association (TNBA) and includes forms, sanctions, membership cards & awards for use in the 2016/2017 bowling season. BTM-2017 manages multi-event tournaments that feature singles, doubles, trios or team events. BTM-2017 also manages all-event entries. 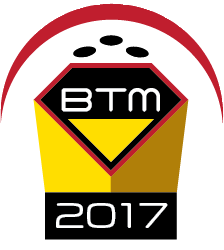 BTM-2017 features easy menu navigation in a manner organized with how a tournament operates, from setup to finish. Easily navigate between squads. Manage as many tournament as you wish on the one computer. Authentic support for Microsoft Windows using digitally signed applications for security and authentication purposes which follow software industry standards. Built-in tournament treasurer module to manage finances for a tournament. Manage men, women, mixed and youth tournaments. Tournaments can have up to 6 events, which can be singles, doubles, trios or teams. Up to 4 All-Events to combine scores from events ran. FREE- Extended Product Downloads – As long as the the program has not reached end-of-life, the installers are available for download FREE without any special passwords or confusing security codes. Additional features available beyond what is listed. Up to 12 games per event. Derived Singles or Doubles events, where scores from a different event also count for the derived event. Linked Events – Such as Singles and Doubles are linked together where bowlers must bowl both and they bowl back to back. Bowler Divisions – Based on one or a combination of items, such as gender, average or age. Team Divisions – Based on one or a combination of items, such as gender, average or age. Men, Women, Boys and/or Girls support. Bowl multiple times in an event, limiting the number of times they may be in the top specified places. Multiple sets. A 6 game squad could be broken up into two different sets of 3 to bowl in the AM and then the PM. Limiting of range of lanes allowed per squad. Which squad is linked to bowl next. Automatically assign to a lane within specified squad. Checks to verify bowler isn’t already in a squad or lane. Registration screen mimics typical city/state tournament entry forms. Recap Sheets on blank or preprinted recaps. USBC Certified Leagues with award detection and forms, membership forms, sanctions forms and more. Fonts customization within multiple reports, changing font style, size and color. Print on available laser, inkjet and dot matrix printers using forms officially approved by CDE Software with our official recap partner Databar. Download program updates from within the program. Record payments and manage treasurer duties with the built-in treasurer module to manage tournament finances. Use to run brackets for fun, to make additional money for yourself, the tournament, the youth program or your favorite charity. USBC allows brackets to be offered for USBC youth tournaments, providing winnings go to scholarship fund. Eight different bracket groups can be offered. Each bracket group can be either scratch or handicap and can be a different price. Each bracket group can either be offered for individual bowlers or teams. Each individual or team can be entered up to 99 times for a total of 999 brackets per group. Expanded number of games per event to 12. Additional report capabilities available only to Pro editions. Compatible with CDE Software’s Aleksis Bowler’s Kiosk, to export leagues and interactive bowler histories. PDF Export of reports, including standing sheets. XHTML / HTML Export of reports, including standing sheets. XHTML 1.0 is the first major change to HTML’s last major change was back in 1997. XHTML takes advantage of the newer features provided by the latest and most common browsers, including Internet Explorer 6 and the upcoming 7 as well as Firefox and Opera. It provides richer web pages as provides a larger compatible base of browsing platforms including cell phones, televisions, cars, handheld wireless devices and more. Compatible Automatic Scoring Systems: CDE Software interfaces with the largest number of automatic scoring systems available on the market. Even older scoring systems may be able to be interfaced by solutions offered by some our of partners. Looking for a new scoring system? Each of our partners provides unique features and offerings. Because CDE Software does not recommend one partner over another, we strongly encourage contacting any of our partner’s sales representatives to find what suits your business and budget. If you have any questions regarding the interfacing of our product with a partner, please contact our automatic scoring division staff. In order to provide improved compatibility and support, many of our scoring partners have chosen to have their systems certified by CDE Software. This process involves the scoring company providing CDE Software with a system to do constant testing and compatibility checks. This also allows for improved integration as well as diagnosis of any issues that may come up, in order to better identify appropriate action and resolution. Some of our scoring partners have either chosen to not be certified, have not yet begun the process or have let their certification lapse. These systems should perform very well with our products, however diagnosis of issues that may come up may be more difficult to troubleshoot or may be delayed in verifying compatibility checks. Some of the older scoring systems, such as AMF Accuscore, Accuscore Color, Accuscore Plus or Brunswick AS80/AS90 scoring systems are generally compatible by replacing the front desk console with a solution by our scoring partners. 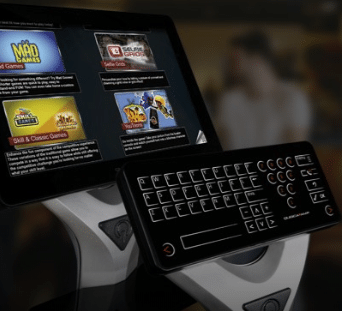 Such solutions include AK Microsystems Touchdesk. Operating System: Windows 10, Windows 8.1, Windows 7, Windows 2016 Server, Windows 2012 Server and Windows 2008 Server (with Service Pack 2). Supports 32 bit and 64 bit versions of these operating systems. Display: 1024×768 or higher display resolution with greater than 256 color depth (16 bit color recommended) with 32 MB of graphics memory. Optical Drive: CD-ROM or DVD-ROM Drive 4x or faster (compatible with reading CD-R’s) – Not needed if installation via download. On April 11 2017, Microsoft officially discontinued all support and updates for Windows Vista. Because of this, CDE Software can no longer offer official support for Windows Vista, nor will continue doing any internal compatibility testing with this operating system. We do expect that this product will be able to install on this operating system and function as designed, provided it has been updated to Service Pack 2, Internet Explorer 9, Windows Installer 4.5 and Visual C++ 2008 SP1 Redistributable and that necessary updates have been installed. For best compatibility and computer security, it’s suggested to upgrade to a newer version of Windows. On April 2014, Microsoft officially discontinued all support and updates for Windows XP. Because of this, CDE Software can no longer offer official support for Windows XP, nor does any internal compatibility testing with this operating system. However, this product should be able to install on this operating system and function as designed, provided it has been updated to Service Pack 3, Internet Explorer 8, Windows Installer 4.5 and Visual C++ 2008 SP1 Redistributable and that necessary updates have been installed. For best compatibility and computer security, it’s suggested to upgrade to a newer version of Windows. On July 2015, Microsoft officially discontinued all support and updates for Windows 2003 Server. Because of this, CDE Software can no longer offer official support for Windows 2003 Server, nor does any internal compatibility testing with this operating system. However, this product should be able to install on this operating system and function as designed, provided it has been updated to Service Pack 2, Internet Explorer 8, Windows Installer 4.5 and Visual C++ 2008 SP1 Redistributable and that necessary updates have installed. For best compatibility and computer security, it’s suggested to upgrade to a newer version of Windows. If upgrading, be sure to change the “Select Most Recent Product Licensed For” in the online store to reflect the newest version of the program you currently are licensed for. Note: If you are a bowling center that requires a version of BTM that integrates with your electronic automatic scoring system, choose the AutoScore edition instead of this edition. All upgrade orders are manually verified for eligibility. If the software was transferred to you by a previous user, a Transfer of Ownership form, from our support section, must be completed, signed and returned to CDE Software before order can be processed.